Salads are always a healthy option, except when they are not. Dressings aren’t consistently on the natural side of ingredients, and the meat, well, sometimes you just don’t know exactly where it came from. When you dive straight into a Paleo lifestyle, you will want to figure out and inform yourself how your vegetables were grown and how your meat was raised, asking yourself the question “What did they eat?”. Knowing how to choose the best salmon will make this recipe one that is asked to be repeated, repeatedly. Salmon that is wild-caught is free of antibiotics, artificial coloring and preservatives. It is fish in its plainest form and that is an extremely important thing. Fish contains omega-3 fatty acids which are vital for high-performing brain function, so if you are looking to boost your memory, salmon is one food you don’t want to miss. Good quality fish oil promotes healthier skin, increases fertility and when the powerful antioxidant astaxanthin is present your immune system will be reinvigorated. Go salmon! To tick all the ingredient boxes you will want to invest in the knowledge of how to make your own homemade Paleo mayonnaise using a blender or food processor. 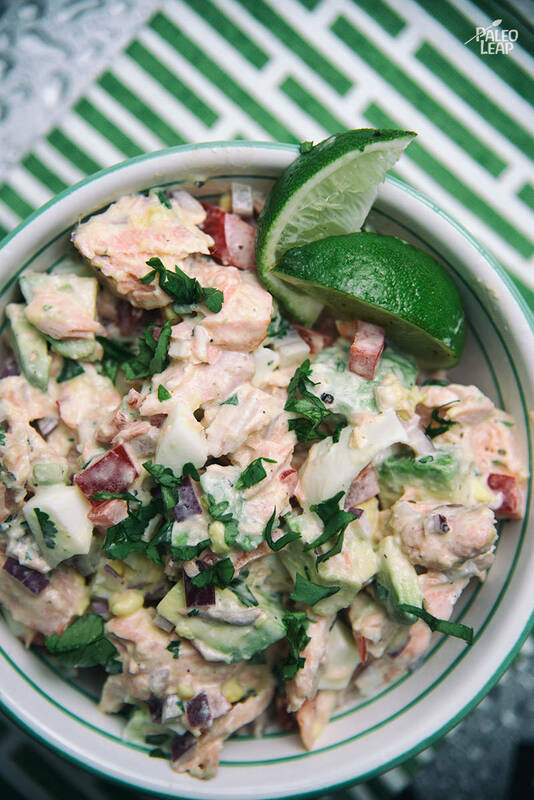 It is an absolute must to learn, because mayo goes with just about everything, including Thai style shrimp patties as well as being a main ingredient in the sister salad to this salmon recipe – Egg and Avocado Salad. Fish or fishless, let your cravings and your mood decide which way to go, as salads are a great way to eat your fresh greens and avocados. In a bowl, whisk the mayonnaise, parsley, lemon juice, cayenne and olive oil, until well emulsified. In a salad bowl add the salmon, diced eggs, bell pepper, avocado, and red onion. Pour the mayonnaise mixture over the salmon mixture. Toss everything gently until well mixed. Refrigerate until ready to eat and serve topped with fresh greens, or just as it is.